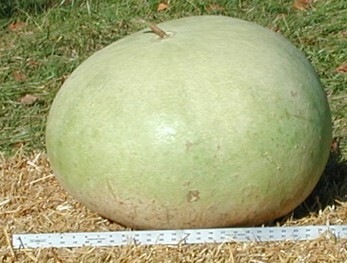 This is a GIGANTIC gourd weighing over 100 lbs. when green. Quite striking when dried, cut, and painted though the drying out process will take several months. The record size for this variety is 168 lbs. and 27 inches in diameter. I did not weigh this gourd but you can see from the 36 inch aluminum yard stick that it is close to record diameter. 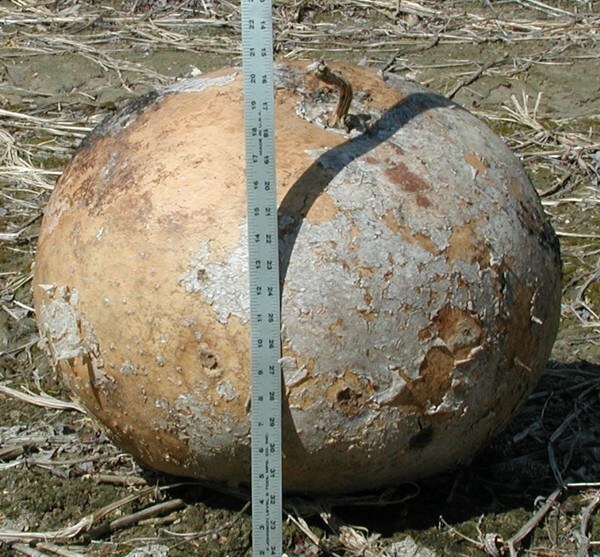 This particular gourd was sold to Alicia W. of Wright City for use as a giant bowl when dry. They are easy to craft and have a good shape. They can also be made into drums, scenes and bowls. Although this is a popular large gourd, the cultural requirements are very unforgiving -- we are lucky to get one green gourd from every 5 expensive seeds! Drip irrigation, a rigid spray schedule, and early germination a sterile, temperature controlled environment are essential. For each perfect dried Giant Bushel Gourd, we usually need to discard 9 green/partially dried gourds due to sun cracking and rodent damage. 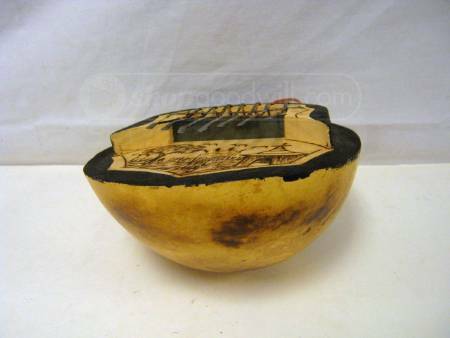 Giant Bushel Gourds can also be used as a dez (resonator for African finger piano).